This guide will help you quickly find the best studio headphones under 300, especially if you don’t have the patience or the time to look at all the products on the market. We did our best to critically analyze the most sought-after headphones. We looked at what value they have to offer for their price, how well they sound and if they are a good choice for a studio and that is how we found out that the Beyerdynamic DT 770 PRO headphones are the ones that you should pay attention to. They are made of sturdy stuff and will work a long time in your studio. Also, due to the velour padding that they have on the earcups, they are comfortable and don’t slip off. They are a great choice for those that like heavy bass songs. If you can’t find them for sale, check out the Audio-Technica ATH-M50x model. The metal in the earcups and the headband, as well as the hard plastic, suggest that these headphones are going to last a while. They don’t slip off your head and they are quite comfortable due to the velour padding on the earcups. Because they boost the bass sounds more, they are a good choice for bass-oriented music. They are very bulky and because of all the metal and hard plastic in them, you will start to feel their weight on your head, after some time. Because of this, they are also not portable. These headphones are good for music creators that want a durable piece of equipment. Being very portable, this pair of headphones can be used for critically listening in the studio or they can even serve as portable casual headphones. The sound that they offer is focused more on bass and most people like to hear that. They offer great separation and stereo imaging and you can hear clear sounds in both ears. They aren’t that good in noisy environments and they could do better with sound isolation. Also, because they focus on bass sounds, they are not liked by every user. Working great in the studio, they are also versatile and can be used as casual headphones too. You will not be disturbed by any noise when wearing these headphones, as they have special microphones that work to reduce the noise level from the inside and outside too. They are also wireless and you can listen to them via Bluetooth. The sound is bright, not heavy on bass and natural enough to allow for critical listening. These headphones are closed-back and that means they will not provide the airflow needed for mixing purposes. The frequency response is also not well balanced for mixing. Being wireless, they are great for traveling musicians, but they could do better when used for mixing. To help you make the best choice, here are some reviews of studio headphones under 300. Each of these pairs of headphones is considered to be a good choice by critics, and they all have good reviews and people like them. They are thus some of the most popular models. In terms of design, the manufacturers make one thing clear – they want these headphones to last. That is why they use a lot of metal in the earcups and the band between them. The earcups are also covered in a thick layer of solid plastic. Also, the cable is well protected by thick rubber and plastic. Comfort is ensured by the velour padding on the earcups. They don’t slip off your head due to that too. Also, they don’t clamp your head and won’t make your ears sweat. If you power them correctly, the sound that they produce is a clear one, good for studio mixing. However, they are bass-oriented and thus everything you listen to will have lower frequencies in it. At first, when you mix with them, you will tend to put more mids and highs in the end mix than it is needed. But you will get used to how they work in time. This set of headphones is the follower of the ATH-M50 model and it has been tailored so that it suits those with a lower budget that don’t really look for the most professional headphones. And because they are based on a great model, these headphones offer similar capabilities, and a sound to match the original. Furthermore, they are highly portable. They are slightly bigger than usual portable headphones but that is because they are purposed for studio use. In terms of looks, they are very stylish and don’t stick out too much. If you want comfort, they deliver that too, thanks to the large earpads that provide room for your ears. Their sound is one that fulfills the tastes of most people and that is because the low frequencies are emphasized. What’s important for a pair of studio headphones is that they offer good separation and expansiveness. A unique feature of these headphones is that they have microphones inside and outside of the earcups and those mics work to block any noise going in or out of the headphones. You thus have an ingenious noise cancellation technology. Another piece of modern technology incorporated into the headphones is that they are capable of using Bluetooth for wireless listening. They can do that because they also work on rechargeable AAA batteries that can last for up to 20 hours. You also have a multipurpose button that can be used to start or pause songs you are listening to, answer and close calls, and even initiate Siri commands. The sounds are a bit bright and don’t focus on bass too much. However, they are a closed-back model and that means you won’t get the most natural sounds that are required when mixing in the studio. Great for studio use, these headphones aren’t a good choice when you’re on the road, but that is not what they were made for. Because they are so bulky, the plastic that they are made of is durable and can withstand most drops. To keep you in a comfortable state during the time you produce music, they have comfortable and large earpads. They give a thumpy and deep bass sound, and that is because they are closed-back models. However, the midrange and treble are powerful enough. Because of their bass, they are most suited for casual listening, but they can do a good job when mixing. As closed-back models, they do well to isolate noise, but they aren’t the best to be worn when commuting. However, that is not their purpose. They do best when you listen to the end mix using them. These headphones hit the market in 1991 and back then plastic was a popular choice. They are thus light and easy to carry around and furthermore, as they are made of plastic, some of the parts can be easily replaced. And that is a useful feature when you take them with you everywhere. They can fold up in a more compact shape, and traveling musicians appreciate that. As they are one of the oldest models still in use, their sound is considered to be standard in the industry. This is mainly because they have the ability to produce a neutral sound needed in the studio. They will deliver sound from as low as 10Hz to as high as 20kHz and they will maintain a constant volume when doing so. Studio producers appreciate them because they have a balanced output of lows, mids, and highs. The metal band going between the earcups is the only piece made of metal; the rest of these cups are plastic. That means two things – the first, they aren’t as durable; however, they are very light. The velour material found on the memory foam placed on the earcups gives these headphones a comfortable feel. These headphones are good for a small studio because they are easy to connect. They offer a classic 3.5mm connection and you can attach a ¼-inch adapter if you need that. Excelling at delivering quality sound for professional mixing, the headphones aren’t great at other things like noise reduction. In terms of frequencies, the mids and highs are great and don’t go over the top. At the same time, the lows aren’t too loud like they usually are in cheap models. This is why you can use the headphones to carefully listen to the natural sound of vocals and instruments. This pair is a great option if you’re looking for some inexpensive critical-listening semi-open headphones. You might notice that they look a bit different and that is because they are based on a design from 1975. In terms of connectivity, they offer the usual 3.5mm cable and a 6.3mm adapter. They don’t have the thunderous bass that dominates today’s style when it comes to headphones and that is why they are good for studio use. They provide very detailed mids and highs and a clean sound. Thanks to the semi-open design, you can feel that they provide good imaging. If you’re listening to Hip Hop, EDM or Drum and Bass you will not have a great time with this pair, because of the lack of bass, but they’re good for all other purposes. They have a brighter sound and they aren’t too sensitive so you will have to put more power into them to hear them well. When looking at these headphones you will have a rightful feeling that they are made to last. And that is true, due to the metal bands that run across them. They can withstand heavy use, drops, and bumps. Their design reminds of professional headphones and they do deliver performances close to those. They feel a bit uncomfortable at first but after you use them more and they get adjusted to the shape of your head, you won’t feel them anymore. Due to the fact that they are an open-back model, they aren’t good for commuting or using them outside, as everyone will hear what you are listening to. But that is also why they are great for studio mixing. Open-back headphones provide a more natural and clear sound. The bass is just right and the mids and treble are at good levels, too. The large circular earcups give this pair of headphones a retro style. These earcups are also well padded for comfort. The headphones are quite bulky, but they are not really heavy and the fact that they have an adjustable headband means that they don’t put too much pressure on the head. Giving a sturdy impression, they weren’t made for being used during physical activity, but they are flexible and should do well in case they are dropped or bumped. If you look at the frequency graph of this pair, you will be surprised by how good it looks. The bass is consistent and even, although the lower the frequency, the lower the volume too. The midrange is well-balanced and so is the treble. In the high-treble area, however, they dip in volume. All these characteristics make them a good pair for vocal-centered music, but not so much for intense bass songs. 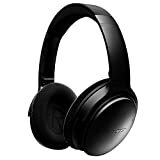 Following the previous model of BlackBeat PRO, these headphones offer the same benefits, with improved characteristics. The earcups are shaped differently but they provide a level of comfort that can be considered better than the original model. However, they don’t fold into a more compact shape and they are quite bulky so you won’t be able to carry them with you. They are well padded and thus comfortable and you can wear them for extended periods. Your ears also have enough space in them and they won’t make you sweat. They have a number of incorporated controls that make listening easier. You have a play/pause button, a skip one, and a button that controls the volume. Because they are so big, they are also sturdy – the earcups are dense and the headband is reinforced with a plastic and metal band that provides enough flexibility. This pair of headphones is an open-back, on-ear model, with a distinctive design. The overall look reminds of the headphones produced in the ‘80s. The earcups have large pads on them to offer a cushy feeling. There are metal prongs that connect the earcup to the headband and that gives a retro look. As they are open-back, in terms of noise isolation they don’t do too much. But that offers a spacious sound when critically listening to music. The bass frequencies are weak, compared to other models, but the mid-range is the pride of these headphones. Even in the high frequencies they act very well and are good at delivering sounds produced by violins, for example. Their interesting design allows you to see the drivers inside. Overall, the headphones feel light but sturdy and comfortable. Because they are the on-ear type, they might feel a bit too flimsy, but that is not really the case. Even when looking at the cheapest headphones, you can still find the quality needed in the studio for critical listening. But, to get the best results you need to know the difference between the kinds of existing headphones. Here are some aspects to take into consideration when you want to find a pair of good studio headphones under 300. 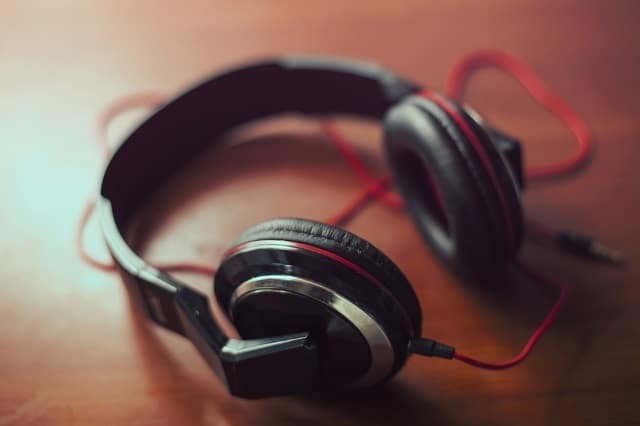 When you know what you intend to use your headphones for, you should also know what type of headphones suit each purpose best. Most people that use headphones extensively would agree that open-back models are the best choice for studio mixing. They do a better job at that, as they let the sound get out, they offer more space, and they thus produce a more natural tone, good for critically listening. When using this kind of headphones you hear everything more detailed – you can hear the instruments as if they were positioned around you, so much that you can imaginarily arrange them in your head. They are a good alternative for monitor speakers, if you are on a tight budget, as they offer the same benefits in a more compact shape. On the other end of the spectrum, the closed-back headphones, also known as sealed models, can offer you the most isolation. That is not really necessary when you are in your studio and there is almost no noise around you. But if you find yourself critically listening in a room of your house, these headphones may work well for you as they can block the noise that your family makes outside your room. They basically allow you to focus more on what you work on. On the other hand, they don’t let the air flow too much, meaning that the sounds reverberate more in the earcups and thus aren’t as natural. Another thing is that they offer less spatial awareness when it comes to determining the position of instruments in a mix. Closed-back models should be used predominantly for recording purposes. There are also semi-open headphones and they offer a balance between the two already mentioned types. When you want to spend many hours in the studio to produce the best music you can, you will need a pair of headphones that offer enough comfort to keep your mind focused. You will be wearing them for hours on end and that is why you want them to put as little pressure on your ears and head as possible. Another important thing is that they should be stable on your head so you won’t have to keep a hand on them at all times. Over-ear models are good at that; however, they sometimes have the problem that they make your ears sweat, as they get too hot and don’t allow for enough ventilation. 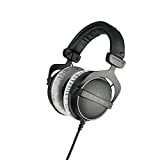 But if you want over-ear headphones and enough airflow, choose open-back models, as they allow air to pass a lot more. On-ear headphones are also good at keeping your ears cool, but they tend to clamp them too much. Sound quality is probably the most important aspect that music producers consider in a pair of headphones. It is important to consider how accurate and balanced the frequency response is and how natural and clear everything sounds. When using headphones in the studio, they should let you hear everything in a precise manner. Most headphones produced for casual listening offer a sound that is nice to hear, but not good for critically listening to music. Sweetening is the term used in the industry for this tendency of a pair of headphones to make everything sound better. However, that is not what you want from a pair of studio headphones, as you need them to produce a sound as clear as possible. If you are critically listening to a mix, you need a flat frequency response, one that allows you to make the fine adjustments needed. You want the sound volume to be constant throughout the song, and no matter the frequency range. Despite what might be believed, when a pair of headphones makes everything sound good, that is an indicator that they are not so good for studio use. Generally, the mid frequencies are the most important in the studio, and that is because you will find there the most vocals and probably most instruments, depending on the music style. That is why the mid-range sounds should be the most precise. However, if you work a lot with drums and your music focuses more on bass, you should get some headphones that do well in those areas, too.